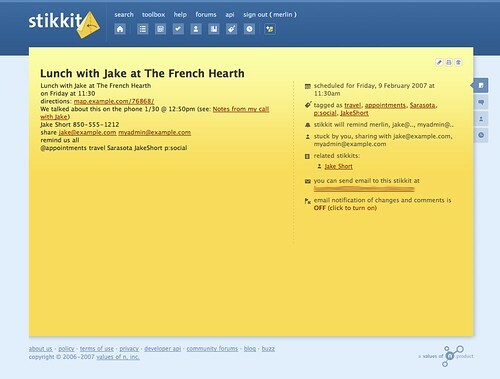 Stikkit gets that I want to reference another stikkit ("123456" is the Stikkit ID for a note about having called Jake), so it hotlinks to that stikkit inline. Thanks to those handy “!”s I added in front of words I want not to be magical ("!1/30 @ !12:50pm"), Stikkit understands that the date and time in that line shouldn't be understood as a new event (so it skips over parsing them). So Stikkit seems pretty smart in its own way. Once you and Stikkit get good at talking with each other, it's generally smooth sailing. 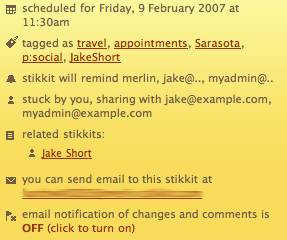 The email Jake receives attaches a .ics version of the appointment, which lets him easily add this event to his own iCal, Gcal, or (I'm told by my wife) even Outlook. I realize this is a lot to digest, and you may want to just jump in and play with this for yourself. If so, it helps a lot to have a copy of the basic "magic words" in Stikkit (provided below). I also highly recommend visiting the Stikkit forums, where Michael Buffington maintains a terrific collection of tutorials and screencasts, and where many like-minded Stikkiteers participate actively in discussions, sharing hacks, and so on. Boosted directly from the Stikkit Help window. As you can see, there's a lot going on in Stikkit, so this will most likely evolve into a regular feature here. I'm planning posts that'll show you how to use Stikkit as your calendar and appointment maker, as a meeting notes app + light project management tool, as well as how you can set Stikkit up as a basic GTD-like personal producivity system. N.B. : Comments for the post are open, but I have to warn you in advance that I'm not exactly a Level 3 support stud (and, believe me, you will have a lot of questions about how Stikkit works). The forums are much better staffed for troubleshooting, getting help, and hosting clever remarks on server uptime. Still, I'm happy to talk about the example above and field any questions that I'm qualified to answer.